I finally placed in my age division! And I got first! Meghan had to pick up something for work at Downtown Disney so I met her for an early dinner at Raglan Road. We had the Garlic Parmesan & Truffle Oil Skinny Chips to start with (these were soooo good!) Then I had the It's Not Bleedin' Chowder! It was seafood and potatoes in a white wine infused cream broth. and my Love With Food Box in the mail! Wednesday--2.87 miles in 29:50. Mile 1: 9:50, Mile 2: 10:40, Mile 3: 10:41, Average Pace: 10:23. Ran with Cori. I had my MRI in the morning. It was super quick. It'll be interesting to see the results next week. I also participated in a Dinner Party Project dinner just for bloggers. It was so fun to sit around talking with fellow bloggers, all while enjoying some yummy food! Meghan and Karen were there too! Kory made us a yummy dinner! 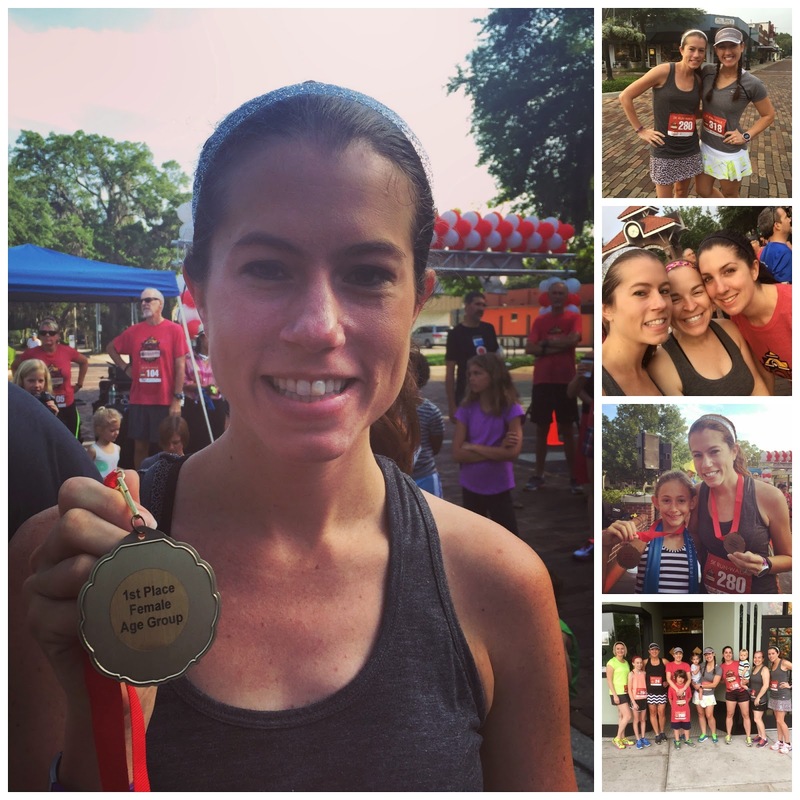 Saturday- Florida Hospital Winter Garden 5k. 3.16 miles in 26:40. Considering my first mile was a sub-8 I went out waaay too fast and had to start intervals at 1.5. Not close to a PR but got first in my age group! Mile 1: 7:32, Mile 2: 8:23, Mile 3: 9:24, Mile 3-3.16: 8:32, Average Pace: 8:27. Then I rushed over to see 2 of my current kiddos play soccer. Later Cori and I drove over to Tampa to have brunch with her parents at Samaria (I had yummy corn beef hash). And we saw the Broadway musical Pippin. I'm not really sure I got it or if I liked it. Sunday--Clay Road 10 Mile Loop Run. I was so NOT prepared for the tons of hills! Ran 4 miles then did 3:1s. Mile 1: 10:42, Mile 2: 10:28, Mile 3: 11:09, Mile 4: 11:11, Mile 5: 11:19, Mile 6: 13:15, Mile 7: 11:17, Mile 8: 12:06, Mile 9: 11:29, Mile 10: 11:42, Average Pace: 11:28. The sunrise was gorgeous but those hills were killer! I know this picture is in my collage above but it needs to be here by itself too. I love how in sync Faith and I are as well as the gorgeous background. I worked in Gangster at the ride later that night and man, I'm not sure how smart it was to do all those stairs at work after doing all those hills during the day. My legs are tired! Congrats on 1st place in your age group!! I got my StrideBox too, and I just cancelled it for now. I like it, but there are too many things I won't use or use right away to pay $15 a month for it. I wish I could get it every other month. I did just subscribe to Love with Food though so I'm excited to see my first box for that!